With Rumors circulating for about a week now, it has been confirmed that the influential Manchester Band "The Stone Roses" will reunite after a 15 year split. An official press announcement took place today in London. 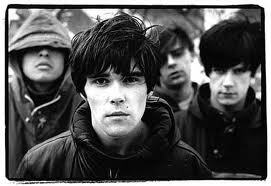 With the news earlier this summer that frontman Ian Brown finally buried the hatchet with guitarist John Squire after meeting for the first time since 1996 at bassist Mani's mothers funeral, it seemed for the first time that there might be potential for a reformation of the original lineup. "This is a live resurrection, and you're invited, so you better be there." The band's 1989 self titled debut album held so much promise blending bits of dance and pop into what became some of the groundwork for the Britpop bands of the 90's , with great tracks like "I Wanna Be Adored", "Waterfall", "She Bangs The Drum" and of course "Fool's Gold". It will be interesting to see if the band does much beyond the expected tour for the easy cashgrab that we have seen as the reason behind many band resurrections.